PARIS, France — When it was inaugurated back in 1989, L'Opéra Bastille in Paris (home to Opéra National de Paris) immediately provided Parisians with a world-class concert hall dedicated to opera. Designed by Canadian-Uruguayan architect Carlos Ott on a massive footprint of 155,000 square metres, (comprising three separate buildings), it opened on July 13—the eve of the 200th anniversary of the storming of the Bastille. 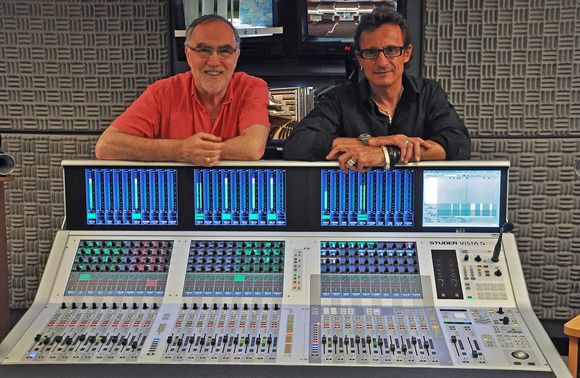 The highly-experienced audiovisual technical team of Serge Dupont and Philippe Taberlet has been supervising Opera Bastille’s production requirements since the very beginning, and 23 years later has just commissioned a new 32-fader HARMAN Studer Vista 5 M2, with TFT meter bridge monitoring, from French distributor Audiopole. This will ensure that the sound quality of future Opera Bastille productions remains at the cutting edge. The new Vista 5 will fulfill all monitoring and recording duties, replacing the house’s long-serving digital desk in the control booth. This overlooks the 2,703-seat auditorium from the upper balcony 50 metres above the ground, while the building itself descends a further 30 metres below street level. Although this is its first experience with Studer, Opera Bastille already had a relationship with Jean-Philippe Blanchard from Audiopole—one of four companies to respond to the tender. He was able to add value to the package by introducing two brand-new Studer products. The new Vista FX engine will enable Opera Bastille to add up to 24 channels of Lexicon PCM-96 effects to the console while the 19-inch Vista Compact Remote Bay (similar to a laptop computer in design), with 12-fader touchscreen and keyboard, provides a slave or secondary desk to work in parallel with the Vista 5—and at the same time lets the team control the sound balance remotely from the auditorium itself. Philippe Taberlet’s original tender had been for a giant automation system, since they stereo record every production for archive purposes. But he jumped at the opportunity to embrace both add-ons—as well as the Vista 5 M2’s meter bridge, immediately seeing the advantage of the peak hold facility and the history mode display. The Vista FX frame includes two Lexicon cards, which will enable them to run two 5.1 surround signals (or four stereo). As for the signal transmission architecture, the Opera House already has a full Optocore optical fibre ring system networking the auditorium with the 450-seat amphitheatre and 237-seat studio (which make up the facility, along with full-size rehearsal stage) and the Vista 5 M2 will plug into the optical ring via the MADI card. AES and fibre will be used throughout, and the Vista 5 M2 itself is configured with 64 MADI I/O channels, with 48 AES I/O, 16 mic/line inputs and 72 analogue outputs. Taberlet and Dupont had wanted a large DSP configuration which will provide them with 96 multitrack busses as well as the 72 D/A converters for outputs, This is because while the bulk of their productions are unamplified (and some subtly so to create the illusion that the sound is transparent) they also have a long association with IRCAM (Institut de Recherche et Coordination Acoustique/Musique) who were set up to explore avant garde electroacoustic music. One of its early supporters was Pierre Boulez, who had originally promoted the idea for the new Opera House back in 1968. Audipole followed up the sale by providing six days’ operator and maintenance team training in advance of the complete commissioning of the new Studer environment. Photo Caption: Opera Bastille’s Serge Dupont (left) and Philippe Taberlet.